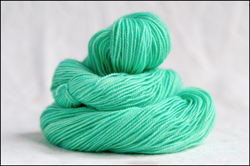 Perfect Semi-Solid colorways to add to your striping socks, or pick a differant, coordinating color for extra intrest! One skein will work for the heel and toes for an average size pair of socks. You will need two skeins for a pair of socks.